Cam Jansen has a special talent. Whenever she closes her eyes and says "click," she can call up a perfect picture in her mind of anything she has ever seen. This is very useful when she plays Geography with her best friend Eric--and also when she's solving mysteries. When Cam and her family meet Aunt Molly at the Royal Hotel, the last thing they have planned for their day is a mystery. But then they meet Mrs. Wright, who gave her luggage and her cat to a bellhop while she checked in, but now can't find them. Can Cam's photographic memory help solve the mystery? 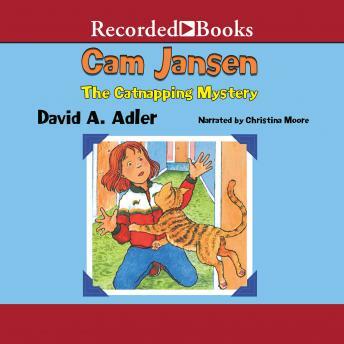 Award-winning author David A. Adler's books, including Cam Jansen and the Mystery of the Dinosaur Bones and Cam Jansen and the Chocolate Fudge Mystery, encourage young readers to pay attention to carefully placed details. Christina Moore's memorable narration adds to the delight of Cam's problem-solving adventures.